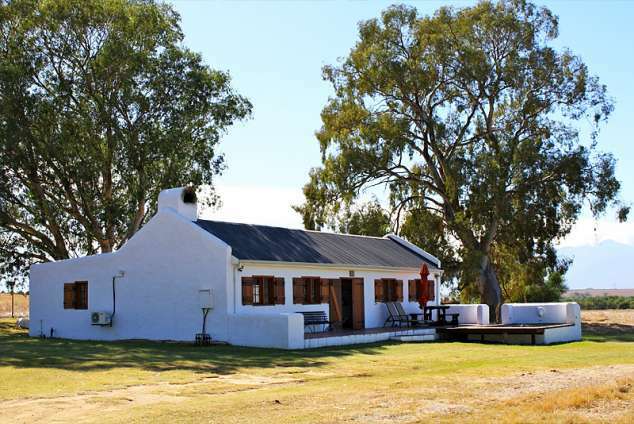 Oude Denneboom - Voor-Paardeberg Accommodation. Oude Denneboom is located in the renowned Voor-Paardeberg area of the Paarl Winelands a Boutique producer of wine and olive oil and purveyor of 4 star accommodation. Our accommodation was born out of the necessity to preserve the old buildings on the farm, The shepherds cottage date from the early 1800's and is located right next to the old wagon trail that used to lead on the way to the voor paardeberg, to this extent every cottage has its own story of a previous life and a different contribution to the farm, They are very important and an integral part of our history and everyday life. It is something we cherish and strive to make it as enjoyable as possible to every one of our guests. The Shepherd's Cottage and Stable Cottage is located in the heart of a private game reserve, surrounded by huge trees and views of beautiful mountain ranges. There is an abundance of animal and bird life, including species such as Springbok, eland, blue wildebeest and zebra. A perfect location for a relaxed holiday, away from the city life buzz. Each cottage can accommodate up to 4 guests and come equipped with 2 bedrooms. The main bedroom features a queen-size bed and a fully equipped modern bathroom fitted with a bath and shower. The second bedroom features twin single beds with an en-suite bathroom fitted with a shower and other facilities. The kitchen is fully equipped with a fridge and freezer, oven and hob, microwave and dishwasher. The living area comes equipped with a fireplace and indoor braai facilities. An outdoor braai area is also available. The newly renovated Vineyard cottages are located on a different part of the farm and is surrounded by vineyards and olive trees. They also have beautiful views towards the Paardeberg mountains. There are two semi-detached cottages. Each have two air-conditioned bedrooms with en-suite bathrooms and can accommodate up to four people. The main bedroom features a queen-size bed and a fully equipped modern bathroom fitted with a bath and shower. The second bedroom features twin single beds with an en-suite bathroom fitted with a shower and other facilities. The kitchen is fully equipped with a fridge and freezer, oven and hob, microwave and dishwasher. The living area comes equipped with a fireplace as well as an outside fire pit. The cottages share a small swimming pool. You can also join the rest of our employees and help with the farm work, and we're sure that your newfound appreciation and improved knowledge will be ample reward for your efforts. 20690 page views since 21 Jul, 2010.